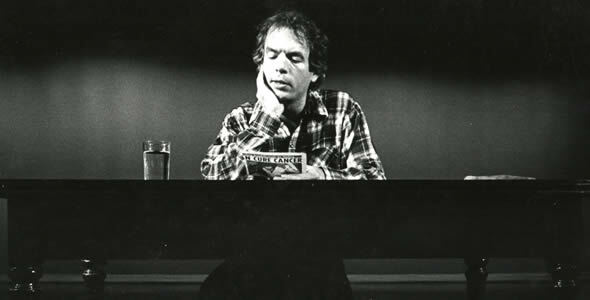 About two-thirds of the way through And Everything Is Going Fine, Steven Soderbergh's documentary about the life and career of writer/actor/raconteur Spalding Gray, Gray relates the story of how Soderbergh approached him to play the character of Mr. Mungo in King of the Hill, the director's 1993 film about a young boy surviving on his own during the Depression. Soderbergh had read Gray's semi-autobriographical novel, "Impossible Vacation", and felt that the regret of the central character fit that of Mr. Mungo, a lonely man living with nearly boundless sadness. When Gray asked what happened to the character in the film, Soderbergh told him that he committed suicide, and this appealed to Gray, who said that at the time Soderbergh approached him, he was contending with thoughts of suicide, and felt that the role would allow him to work out his fantasies of killing himself through a creative medium. The story is typical of Gray, who spent much of his career as a celebrated performer and monologist telling intensely personal stories from his life with equal amounts bracing candour and biting wit. Even stories that draw on his darkest hours, such as his mother's suicide, his life-long battle with depression, and the car crash which left him on crutches (and likely triggered the final bout of depression that led him to commit suicide in January 2004), are told in a way which is engaging and entertaining, and the man that emerges from Soderbergh's film is a lively, intelligent and captivating figure who was fascinated with storytelling, and who found profundity and humour in everything and everyone. At the same time, Soderbergh never shies away from showing the moments when Gray directly addresses those dark, painful and humiliating moments from his life, and whilst those moments may appear darker in light of how Gray's life ended, they also serve to illuminate what a brave performer Gray was. He was in some ways the theatrical equivalent of Kurt Vonnegut; someone who looked deep into the abyss without blinking, then described it in a way which managed to be enthralling without hiding the pain that lay beneath it. Assembled from a mixture of home movie footage, television interviews and footage from many of the signature monologues that Gray performed over his career, And Everything Is Going Fine serves as both documentary and tribute, and it does so in a manner which does a great service to its subject: it allows Gray to speak for himself. There are no outside contributors, with the exception of people featured in the clips themselves, such as home movie footage of Gray talking to his father, which gives the impression that the film is a new monologue by Gray, one which touches on the themes that occurred throughout his career whilst also hitting all of the major milestones of his life along the way. It's a eulogy delivered by the deceased, and for a man who spent so many years talking about himself, it would seem almost perverse to let anyone else tell his story. The approach is lovingly sincere, suggesting the respect and affection that Soderbergh has for his subject, but is also somewhat limiting, since it means that Soderbergh cannot offer any greater sense of what Gray meant to American theatre other than his own personal perspective. That perspective is fascinating, especially when Gray discusses his particular methodology and why his associative way of working sometimes made it difficult for him to perform lines as written when his first instinct would be improvise and branch off from those lines, but it restricts the scope of the film to a degree that might prove frustrating to people unfamiliar with Gray's work, or who want to have a great sense of what his work meant in a broader context. However, as an introduction to Gray and his work, rather than framework within which that work was created, And Everything Is Going Fine is terrific. Since Gray was someone who clearly thought deeply and often about his process and his inspiration, the film contains plenty of trenchant insights into his life and mind, whilst the footage of his monologues give a great sense of what an electrifying presence he could be on stage with nothing but a table, a chair and a glass of water, which was all that he needed. More than that, it presents an image of a troubled, sad but garrulous and preternatural storytelling whose wit and intellect are sorely missed, which also allows him to have the last word. There can be no greater tribute to the man and his legacy.